Born in 1906 is the intriguing title of this release from the Latvian-based Skani label. It was a year of immense significance for Latvian music, witnessing the birth of two of its finest and best -Volfgangs Dārziņš and Jānis Ivanovs. For those encountering these two composers for the first time, I must single out the accompanying liner notes as being extremely informative in the way of biography and context. They point out the many parallels between them. Although both were born in Latvia, they and their families spent the years of the First World War in Russia, both returning to their native country after the cessation of hostilities. Both young men enrolled at the newly established Latvian Conservatory in 1924, studying under the renowned Jāzeps Vītols. Here they gained a conservatively classical grounding in the German-Russian tradition. This did not hold either of them back, and both went on to push the boundaries of the restrictive confines of National Romanticism. That’s where the similarities end. They were men of totally different temperaments. Dārziņš, son of the composer Emīls Dārziņš (1875-1910), was a dashing type with a passionate love of sports. Ivanovs was reserved and introverted, a man who regarded people with some suspicion. Dārziņš combined the roles of composer, concert pianist, teacher, music critic and, like Bartók, ethnomusicologist. In this latter role he carried out extensive research into his country’s folk music, mapping the distribution of many folksongs. These traditional Latvian elements can be found in his music. Ivanovs remained a staunch symphonist throughout his career, completing twenty in all. Dārziņs emigrated to Germany in 1944, and from there, in 1950, went to live in the United States, where he remained for the rest of his life. He died in Seattle in 1962. Ivanovs was the proverbial home-bird, staying put in Latvia until his death in 1983. Dārziņs’ Piano Concerto No. 2 is an early work, Ivanovs’ Symphony No. 20 came at the end of a long life. Dārziņš’ early attempts at a piano concerto date from 1934, with a student work performed by him as part of his final exam at the Conservatory. The Piano Concerto No. 2, we have here, was written in 1938 and was premiered by him a year later. I have to say that I rather like it, and it’s a pity it has lain dormant for years. There was a failed attempt to rehabilitate it in the 1970s, but it had to wait until 1986 for its next performance, when pianist Māris Zembergs and the Latvian National Symphony Orchestra did the honours in Riga. The opening movement reveals some exquisite woodwind scoring, warmly impressionistic. The piano enters a few bars in, eloquent, elegant and poised. However, Dārziņš’ aim isn't just to seduce and bewitch the listener with a surfeit of beguiling lyricism, there are moments of intense drama too. The second movement is a theme and variations. For me the ghost of Scriabin hovers over this movement more than the others. There are moments where the music is intensely impassioned and chromatically tortuous. The finale is both animated and forward driven, with the general mood upbeat and convivial. Ivanovs’ Symphony No. 20 was his last completed work in the genre (Symphony No. 21 remained unfinished at his death and was completed and orchestrated by Juris Karlsons). The 20th was premiered in 1981. It’s cast in four movements, a traditional form the composer thoroughly approved of; all bar four of his symphonies were structured in this way. The work is tragic and deeply personal. He had confided to his wife that this was his requiem. One senses darkness, pain and suffering in the opening movement. Powerful and dramatic, the inner conflicts are almost too difficult to bear. Midway a funeral bell tolls. The Adagio is no less tragic. It's an elegy, where the composer contemplates death. A brief Menuetto follows, with the composer wistfully recalling the days of his youth (Reminiscenca). The imposing finale is impulsive and energy-driven, yet there are some reflective and melancholic quiet sections, which provide some welcome contrast. The tolling bell returns in the closing bars of the subdued ending. 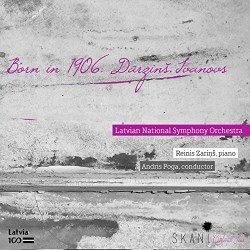 Both works are ideally served by the deeply committed readings and polished ensemble of the Latvian National Symphony Orchestra, under the inspirational direction of Andris Poga. The pianistReinis Zariņš not only relishes the Concerto’s generous lyricism, but injects plenty of personality into his playing. This is a rewarding release and earns my enthusiastic thumbs-up.